With modern society getting most of their information from the Internet nowadays, it is imperative for businesses, organizations, institutions, freelancers, and even private individuals to develop an online web portal to keep up with the times and stand out from their competitors. A well-designed website can do wonders for any business as it provides lots of benefits and advantages. With different platforms to choose from, you will always have a wide range of features and functionalities that will cater to the needs of different website niches such as hotel establishments, travel businesses, and other hospitality-related websites. One of these web design platforms is Drupal, an open-source content management system that is powerful, effective, and flexible in terms of web design development and customization. If you want to design and develop your site with Drupal, you will find you have lots of possibilities and endless options that you will definitely enjoy. Packed with the latest web design trends and conforming to recent industry standards, best practices and technologies, a powerful Drupal template will allow you to create an extraordinary website that your viewers will absolutely fall in love with. 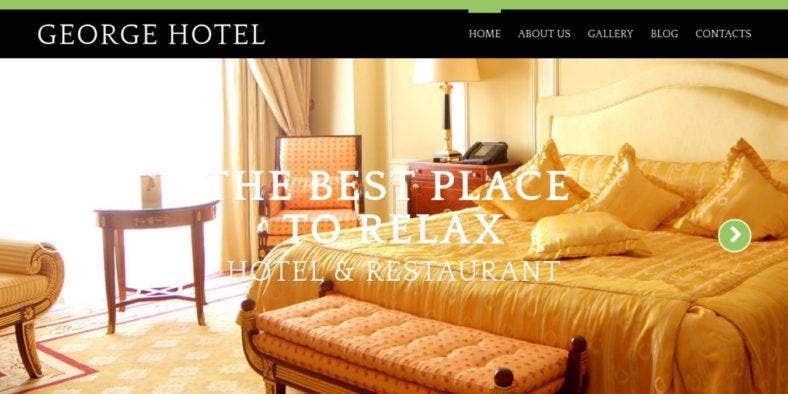 Below is a curated collection of the best and most exciting Drupal hotel themes and travel website themes that you can use for your business. Carefully selected and chosen for their feature-rich designs, these website themes and templates are definitely going to give you the best web development experience thanks to their highly-professional, creative, and trendy look with many available features and options that allow you to customize each theme to fit your business needs and preferences. So, dig in and enjoy. 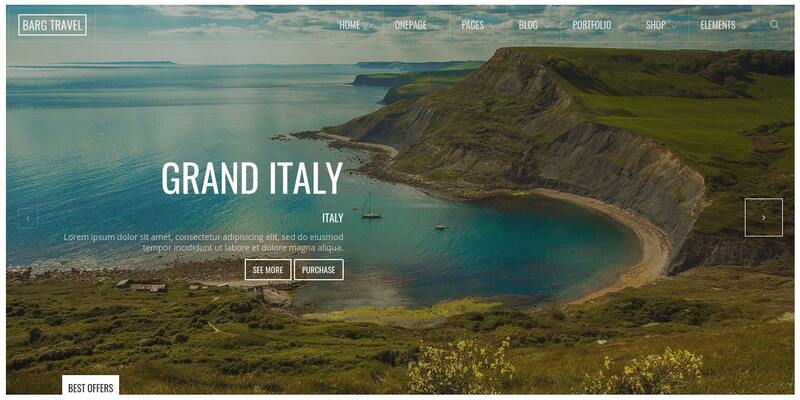 Travelop is a travel blog template from Drupal with a simple, clean design and an ample amount of white space on the layout that allows your content to shine. Built with Bootstrap, it has an easy and intuitive user interface with tons of settings which help you install, fine-tune, and maintain your website easily, even with no coding skills. It can also be used as a personal, lifestyle, or fashion blog template. This template guarantees full responsiveness and compatibility with all modern devices. Also, it includes state-of-the-art features like the various home page layouts available for you to choose from, a number of customized header styles, different blog settings, elegant typography with Google Fonts integration, and many others. With these attributes, you will be able to customize your site to present your travel escapades in a unique way. 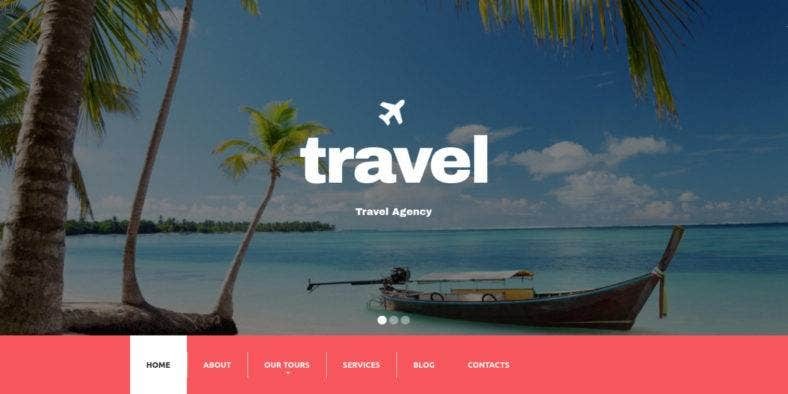 Travel, as its name implies, is a travel agency Drupal theme with a fully responsive layout over a clean and simple design. With a beautiful full-width image slider in the header, you will be able to showcase different destinations included in your packages and entice potential customers to avail of your services. Aside from using it as an agency website theme, you can also use this template for blogs, forums, portfolios, and other personal websites. Since it’s made with Drupal, it includes a bunch of robust features such as advanced Theme Options and sliced PSD for easy customization; drop-down menu; sortable gallery, and commenting system for a dynamic user interface; Google Web Fonts and Favicon icons; and so much more. It also comes with several Drupal modules like Addthis, Flexslider, Superfish, Block Class, Module Filter, and others. 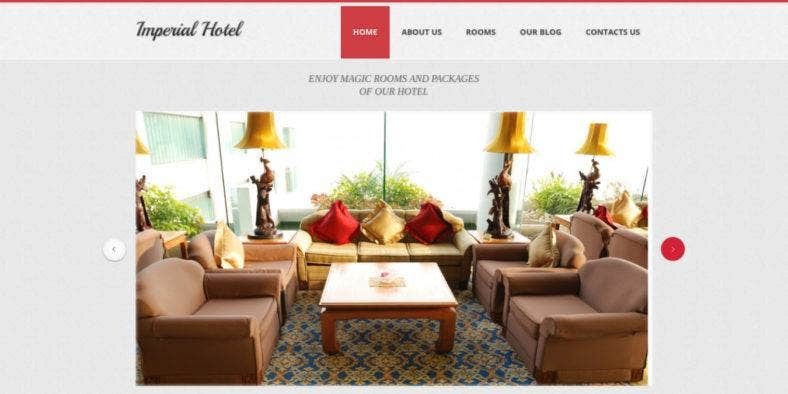 George Hotel is a modern and professional hotel website template from Drupal. 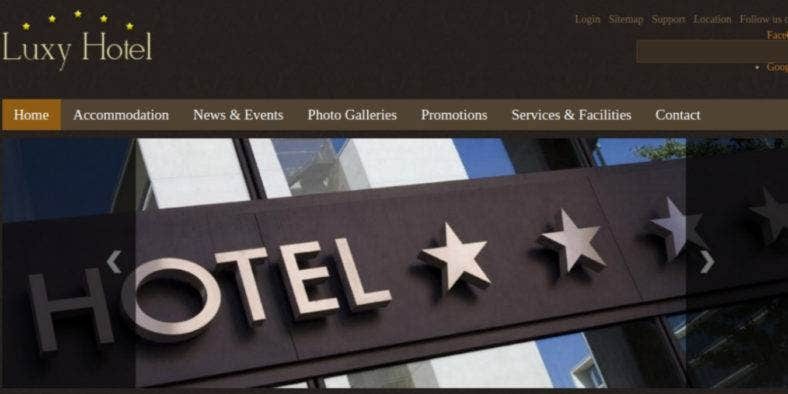 Featuring a clean and minimal design with parallax and lazy load effects, topped with a full-width image header and a stunning text slider, this template ensures revenue growth for your hotel business by attracting potential customers to your site. Apart from its very appealing look, this template also boasts an unmatched performance thanks to the many features included in the theme. Among these features are the fully responsive layout with a drop-down menu and back-to-top button for effortless navigation and exceptional user experience, a number of custom page templates you can choose from for different web pages, a large set of customized Drupal modules and advanced Theme Options for easy customization, several Webforms which include a working contact form, and a powerful admin panel where you can manage your site. Wermoth is a rather straightforward Drupal website theme developed with luxury hotels in mind. It comes with a simple and clean design with the purpose of boosting your site’s organic search results to get more leads and reservations. It features a full-screen image background with various blocks and sections for different services and other content types presented right on the front page, giving the viewers what they want right away. Made with valid HTML5, CSS3, and jQuery code on the Drupal platform, this theme has a collection of awesome features and options which enhances its usability and functionality. Included in this selection is a highly responsive layout with a drop-down menu and back-to-top button for smooth navigation, sliced PSD for easy customization, an efficient admin panel for the effortless management of your site, and customized modules to build dynamic web pages. 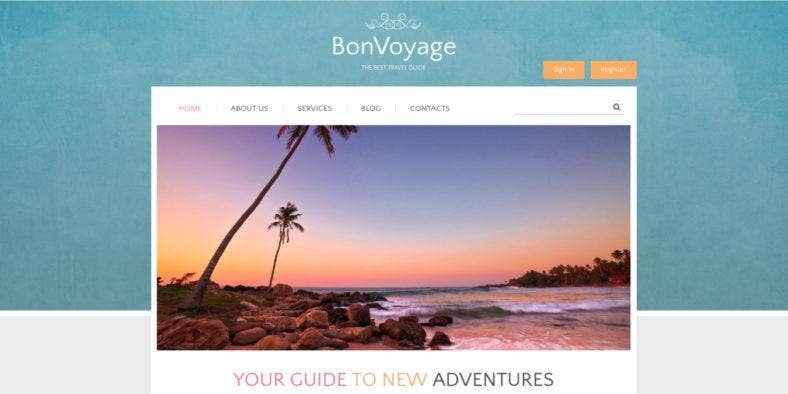 BonVoyage is another Drupal website template with a simple yet gorgeous design thanks to its pastel-colored color scheme and minimal boxed layout. One of the most eye-catching features from this template is its hot slider header which allows you to showcase stunning images of various travel destinations as well as promotions, events, and hot deals. This template is used as a travel guide or a digital marketing tool for travel agencies, tour guides, and such, while private individuals can use the theme as a beautiful storage of their travel memories in the form of an online blog, journal, or diary. With graphics and elements kept at a minimum to accelerate page loading, it still allows you to easily add videos and high-resolution images as well as other unique content types. 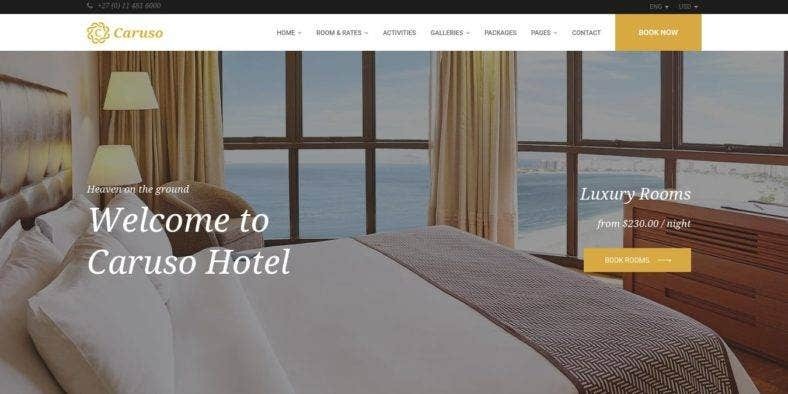 Motels of California is a beautiful and elegant website template made with Drupal for hotel and motel booking companies. It comes with a large slider in the header which you can fill with high-resolution images that showcases gorgeous images of your hotel and motel accommodations, drawing interest from your viewers. It also features a stunning image gallery to make sure your audience end up booking a reservation before leaving your website. Aside from these useful features, the template also comes with unique fonts, matching background colors, tabbed navigation system, and more in order to create just the right atmosphere for your business. Furthermore, it also allows you to present essential information about your company and the services you render through an informative text box at the center of the page. Fully responsive, it also adapts to various devices for better readability. 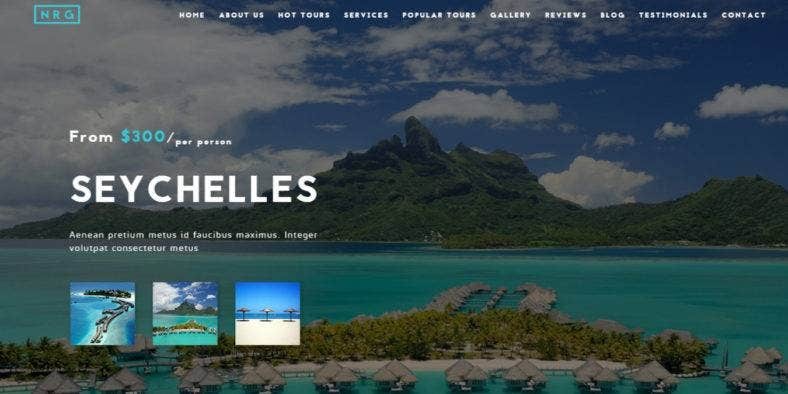 Hot Offers is a responsive Drupal template that comes with a full-screen background slider where you can show off gorgeous images of the hottest and best travel destinations included in your travel agency’s packages and offerings. Its image-heavy design is enhanced with an equally beautiful typography that is composed of a number of Google Web Fonts and Favicon icons, along with a fully responsive layout with parallax and lazy load effects. Undoubtedly, this template enables you to provide your visitors with an elegant and engaging experience with lots of amazing functionalities added to its already eye-catching and easy-to-navigate looks. It includes a number of popular and useful Drupal modules such as Addthis, admin menu, Colorbox, Flexslider, module filter, Superfish menu, semantic views, and so much more. It easy to manage and adapt, letting you create an awesome website for your business. 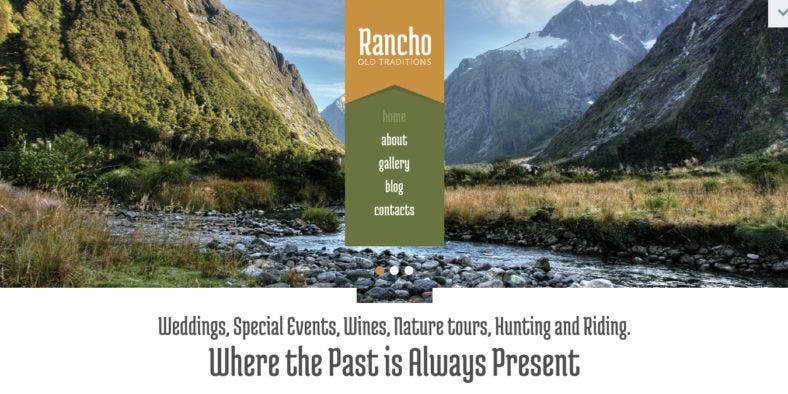 Rancho comes with a design that perfectly embodies the spirit of traveling and faraway places, making it the perfect web design tool and a great choice for your travel websites, blogs, journals, or portfolios. Share your adventures and once-in-a-lifetime experiences with this travel template that features a fully responsive design which adapts well on every type of desktop and mobile devices of all types of screen sizes and image resolutions. This super theme is easy to implement thanks to its collection of customized Drupal modules which allows you to build highly functional and professional web pages easily. Its valid coding and well-documented source also help you set up and customize the template according to your needs and preference. Among its features are the back-to-top button, commenting system, drop-down menu, live search, social media options, cross-browser compatibility, and more. 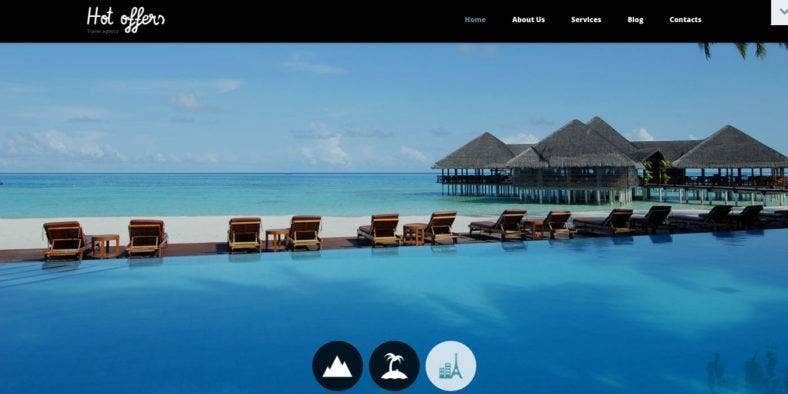 Bongo Mongo, correspondingly, is another exciting and freedom-inspiring website template with an obvious love for nature and the outdoors as it features a large image slider for highlighting gorgeous images of your tropical hotels and accommodations. This hotel template also comes with a 100% responsive layout which ensures adaptability on any mobile device your website is viewed on, together with other visual features that this theme includes. Other than the mobile-friendly design, this template also features a drop-down menu, a back-to-top button, and live search, which give your viewers easy navigation capabilities and an awesome user experience. It also includes a commenting system and social media options which help you reach out to your audience and keep in touch with them through other social platforms. Its customized modules and detailed documentation let you modify the theme to fit your taste as well. Imperial Hotel is a neat and attractive hotel website theme from Drupal that features a pleasing boxed layout, lovely icons and font package, and a subtle color scheme. Its overall design has a fun and novelty feel with a professional and polished aura at the same time, which is perfect for luxury and highly starred hotels. With warm colors and comforting hues, your customers won’t spare any moment to book their accommodations. In addition, this cool website theme also boasts of a well-structured content placement with a top slider used to highlight your establishments’ best rooms as well as other strategically-placed sections, so viewers can easily find the right information they need. Its main drop-down menu also provides a comprehensive navigation for users, while its powerful admin panel provides an easy management and customization system for your site’s administrators. TB Travel is a top-class website template especially built for travel and tour agencies. What makes this theme special is that it includes six available color skins with modern and fresh designs. Most importantly, it comes with exclusive content types that are essential for your travel sites as well as bonus 404 and 403 pages. All these pages are ultra responsive and optimized for any device, whether desktop or mobile. This template is also built with various third-party modules such as TB Mega Menu, Superfish, Views, Views Slideshow, Quicktabs, Fivestar, and so much more. These modules are some of the most popular web design modules and are strongly supported by the Drupal community. They help boost the functionality of your website as it complies with all the Drupal standard practices. The theme is highly customizable and flexible that it can be used for other purposes. 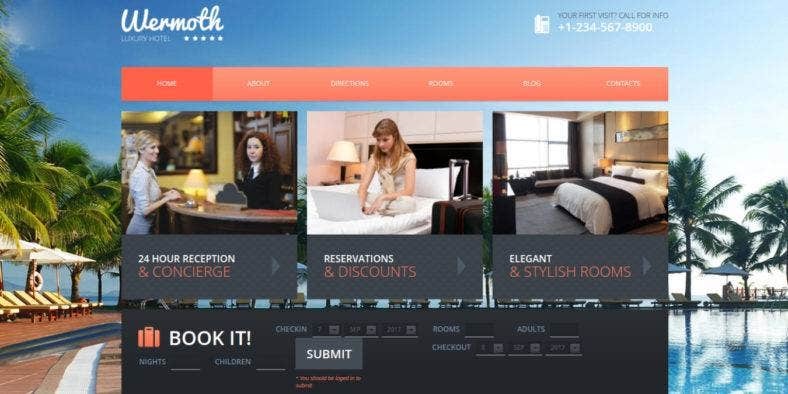 Aloha is a resort and spa Drupal theme that will help you make a lasting impression. 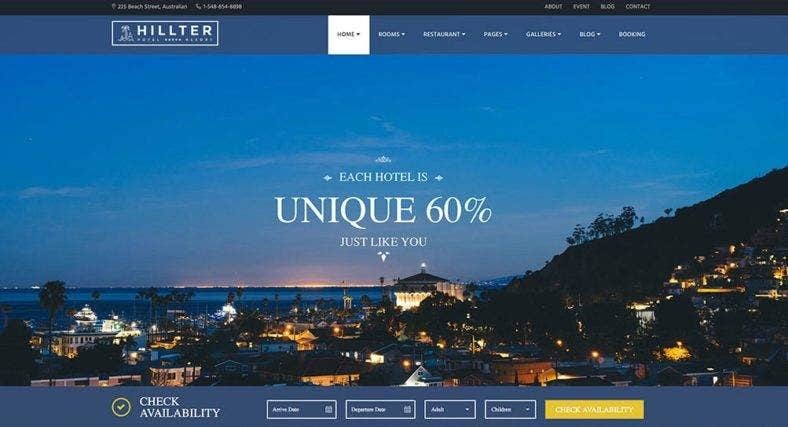 With its clean design and simple navigation layout, it’s a great choice for any hospitality website that is looking for a fantastic theme that will help present products and services neatly, as it also includes a full-width image slider in the header which lets you showcase gorgeous pictures to entice your viewers. Aside from the ones mentioned, it also comes with several amazing features and built-in modules which help boost your site’s functionality and usability. To start with, the theme is embedded with seven skin colors and three eye-catching styles to choose from. With its tremendous customizability and flexibility, it allows you to modify the structure, block, and menus to suit your business preferences as well as save you time and cost. 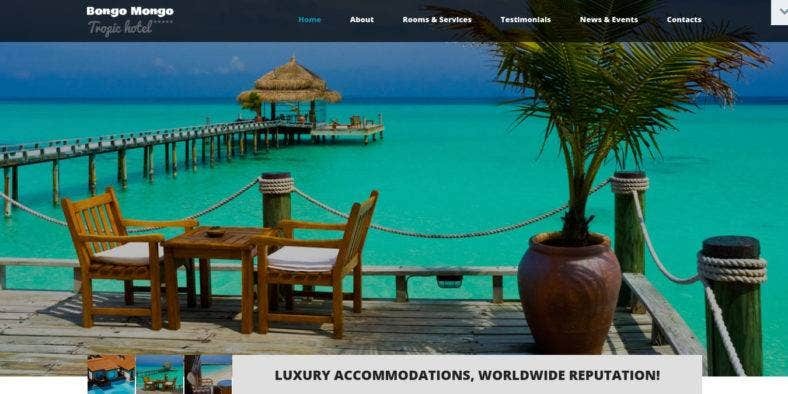 Luxy Hotel is another Drupal website template built especially for hospitality services such as accommodation and lodging, travel and tour services, bars and restaurants, event planning, cruise lines, and such. A Nucleus-based theme, it comes with three subtle color schemes to choose from so you can create an online portal for your company that suits your brand image well. Among the theme’s features are its high usability thanks to its sufficient amount of available features and built-in modules that are very easy to use, as well as its cost-saving ability as it reduces the time and cost of building your website with its fast setup and easy customization processes. Even without any coding or programming skills, you can simply configure all of your site’s elements and content to match your preferred style. Booking Plus is a Drupal theme for business web portals, particularly booking websites. It is a responsive website theme that looks great and professional, making it perfect for any related businesses like hotels, hostels, motels, apartments, etc. It is a complete booking and room management solution which provides every functionality you need to set up and run your business. Built on the robust, state-of-the-art, mobile-first foundation of Bootstrap 3, the theme is integrated with useful modules and content types which enable you to give your customers essential functionalities such as easy checking of room availability, full Commerce integration to manage payments, effortless room pricing management, room add-ons support, awards and high-rating displays, a full-screen slideshow, and more. 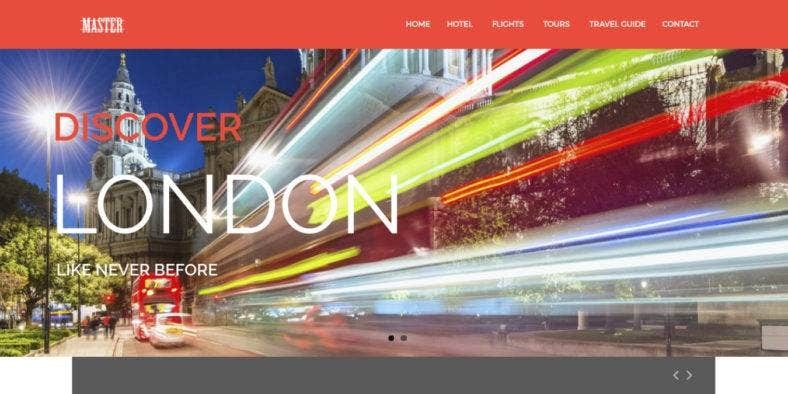 Master is an ultimate travel Drupal theme with a unique and modern design that features unconventional layouts and eye-catching elements that you and your customers will absolutely love. It is a powerful Drupal template that complies with all the latest web design trends and functionalities such as its full responsiveness, which is a great tool to attract more viewers to your website and is perfect for travel blogging and content management. As a directory and listing template, it comes with listing and grid views which include a details page to provide more information about your offerings. At the top of the page is a stunning slideshow with several option to suit your preference. The Mega Menu gives your audience a comprehensive and well-organized list of all the contents of your website for easy navigation. It also includes a number of testimonial variations, a blog page, and more. NRG Travel is a modern and professional one-page website theme for travel and tour agencies as well as other holiday-focused businesses. Made with the latest Drupal 7 version and based on the most recent Bootstrap 3 update, this theme provides a powerful and attractive web presence that will surely draw your audience’s attention and interest, with its cross-browser compatibility and pixel-perfect, fully responsive, retina-ready design. Also included in its top features is the clear and easy-to understand documentation and configurable custom theme settings which both beginners and advanced users can easily utilize. Other features include a beautiful hero slider, touch-enabled and mobile-optimized tabs, a dedicated blog page with blog post and comment styling, smooth animations, light and speed optimized design, and a number of native content types, among others. 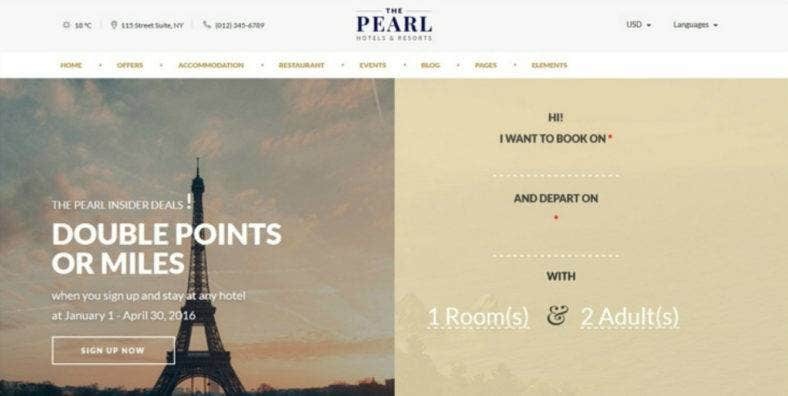 The Pearl is a robust hotel booking Drupal theme which would be an ideal choice for any hotel and resort website. With a fully responsive layout and feature-rich design, this theme will help you run an online portal for your business in a more convenient way. Clean and simple, it features a classic two-column header where you can integrate both an introduction to your place and an easy-to-access booking form right at the front. Featuring a very useful Pagebuilder, this business theme also includes five styles for room display and dedicated pages for restaurant and gallery, as well as other essential website pages such as the blog page, guest book, events page, activities page, terms and conditions page, 404 error page, and so on. The theme is also cross-browser compatible and retina-ready, and includes the premium MD AWEContent module which helps you build your website easily. Dylan, on the other hand, is a minimal Drupal theme with a highly responsive design optimized for multiple purposes. It comes with over 20 different concepts for various business niches, including travel. With a clean and simple layout, the theme is topped with a full-screen image background where you can showcase stunning images related to your content as well as a text slider to attract viewers and potential customers. Apart from these, the theme also features awesome blog pages with different blog styles, namely metro, masonry, and classic. It also includes an impressive grid portfolio built with the powerful Visual Composer with a choice of boxed or wide layouts with filters to show off gorgeous images of your products or services. The theme also feature a one-page or multi-page design, light or dark Navbars, several blog page styles, parallax sections, etc. Berg is another multipurpose Drupal theme with one-page and multi-page layout options for over 45 different home page demos with detailed and incredible designs. These demos are ready to use and easy to install, and include over a hundred HTML files, feature sections, and lots of web elements that you can use to build your web pages and run your very own business website. With full Drupal Commerce support, you can also turn this theme into an eCommerce website with shop pages as well as cart and checkout functionalities. In addition, it features eight different header styles, light, dark, and transparent menu bars, Font Awesome icons, Flaticons, blog, portfolio, and Commerce pages with various layouts, other unique layouts for other pages, custom backgrounds, powerful shortcodes, and many others. 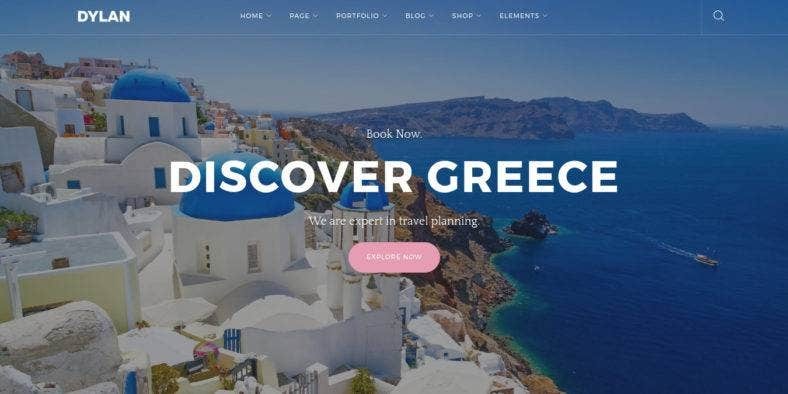 Tourism Plus is a gorgeous website theme built especially for tourism-related businesses such as rentals and destinations. 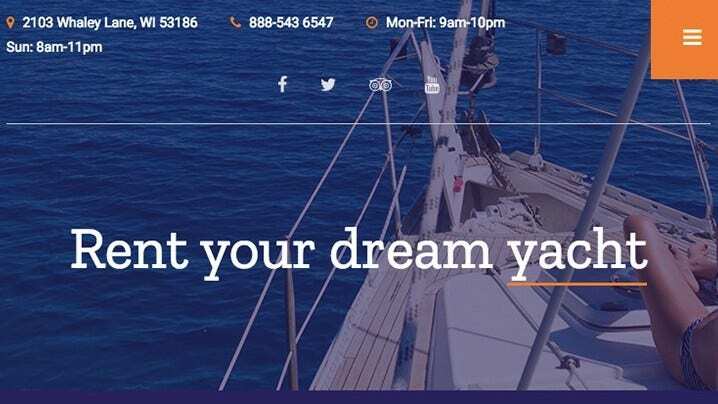 This template is such a great time-saver as it comes with special content types like “Yacht” (or any type of rental), “Destination”, “Team Members”, “Testimonial”, and “Client Showcase”. These are very useful in convincing your potential customers by presenting all the good stuff about your business. Other features include over a hundred theme settings with alternative headers, views layouts, animation options, slideshow settings, and more in order to help you customize your site with unparalleled flexibility. Furthermore, this theme also allows you to integrate videos and video galleries on the slideshow or any internal pages, providing you with more ways to market your business, along with other landing page designs to choose from. Caruso is a complete hotel HTML5 template for Drupal as it comes with a modern and professional design, and tons of functionalities that a hotel or resort website needs. Based on HTML5 and CSS3 technologies, it comes with a bunch of state-of-the-art features and options as well as many advanced Drupal modules. It is also integrated with the most powerful content builder, MD AWEContent, which allows easy customization even without coding skills. The theme’s features also include a Mega slider that provides beautiful slideshows with smooth transitions and effects, additional AWEContent objects for a greater variety of elements, a photo gallery with four styles to choose from, Drupal Rooms for efficient booking and room management, tons of powerful theme settings and options, full responsiveness to ensure your site works seamlessly on any device, and so much more. 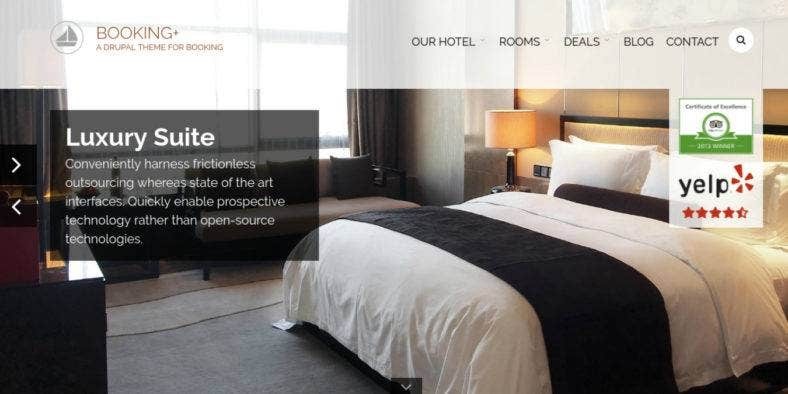 Hillter is an elegant and modern Drupal theme for hotel bookings that is packed with a bunch of awesome features and tons of customization options. A perfect web design tool and template for any type of business like hostels, resorts, villas, bed-and-breakfasts, and so on. 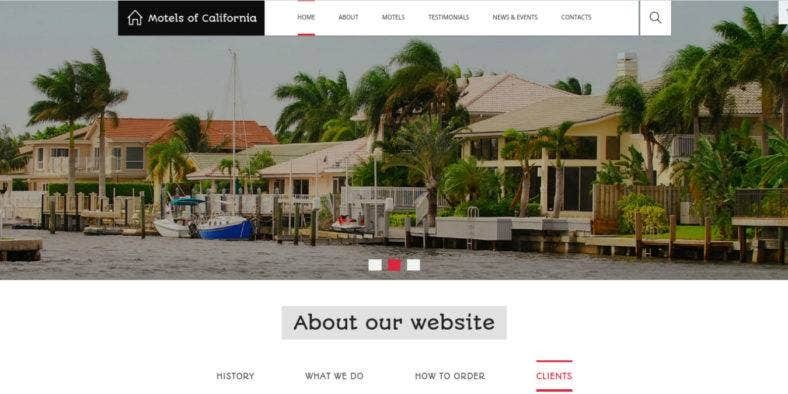 It is fully responsive, retina-ready, and cross-browser compatible, so your website adjusts and displays well on devices of different screen sizes and image resolutions. From the top, it features an eye-catching header with multiple built-in sliders at the banner to catch the eyes of your visitors and clients. An advanced booking form and a hotel room management system are positioned right on the homepage and at the forefront to facilitate immediate responses from your audience. Also, the theme features six styles for room display, four restaurant page styles, three gallery page styles, and more options for other essential web pages. So, there you have it. Guaranteed to give you the best Drupal themes available in the Internet today, we made sure that these website templates are integrated with the most awesome features, options, and modules that you could ever ask for in order to set up and run a highly efficient and functional website for your many different businesses. 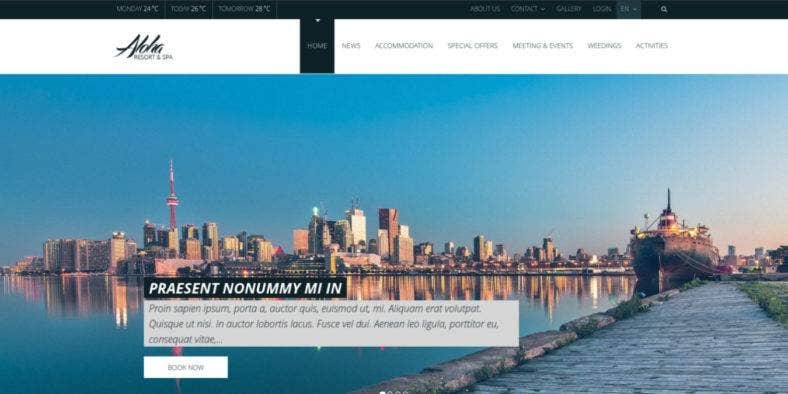 Make sure to grab one or more of these exciting Drupal themes and templates for all your hotel and travel websites as well as other business websites. And while you’re here, take time to discover our collection of amazing website themes and templates that you can find only here at Template.net.